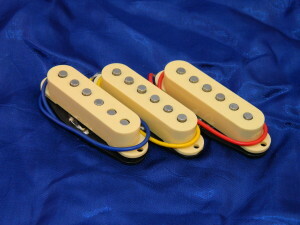 The Ironstone Stratocaster pickup family shares the warm, bright vintage tones. These are mainly derived from the use of Alnico V pole pieces. Yet each style has its own individual character blended with that base. This is driven by the level of copper windings (and thus resistance) of the individual pickups, and the overall make up of each set. The Strat sound clips Hybrid style below give a representative sample of the tones available from this style. The Hybrid tone is not so much an artist as an era! Think classic late 60's, early 70's Fender & artist like Hendrix, Gallagher & Trower. Ironstone are happy to include good quality customer's Strat sound clips - please just get in touch through the Contact Us page. Thanks to Nev Jones for these Sound clips recorded on Audacity to PC via a Zoom 4040. Once again, Nev Jones with Sound clips recorded on Audacity to PC via a Zoom 4040. And thanks also to Paul White for some clips recorded with a Vox amp set to Vox AC30TB (Top Boost). A big thanks for the following YouTube video to Tom Ferno demonstrating the full range of switch positions with a Hybrid pickup set installed in his own custom built guitar, along with an elapsed time build sequence. The guitar also features a truly wonderful colour finish thanks to his daughter! Full details on the YouTube page.